Lawns need about an inch of water per week. 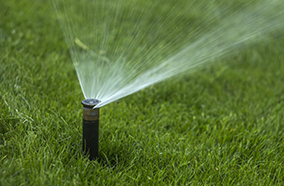 To determine how much watering time that requires, place an empty tuna tin within your sprinkler’s range, and note how long it takes to fill. In addition, note if the water is "running off" rather than soaking in. Adjust your time accordingly (you might need to have 2 shorter cycles initially until the soil is absorbing, so you will need to monitor this. Attach rain barrels to downspouts (check your neighborhood's restrictions and covenants beforehand), in order to catch and hold roof runoff and then re-distribute it to your lawn, garden or container plants. Keep it covered for safety reasons, and to prevent mosquitoes from breeding. (Note: rainwater is actually better for plants because it doesn’t contain chlorine and has an ambient temperature).